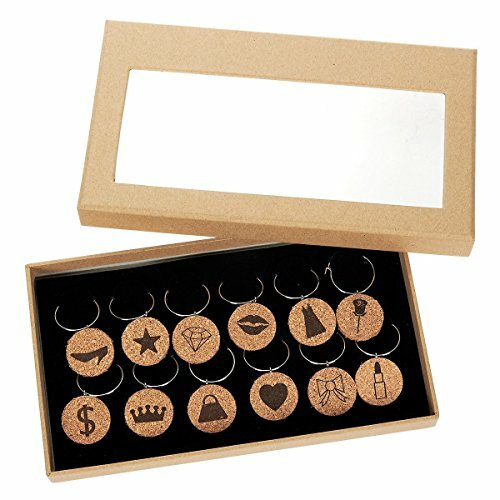 These charming and cute "wine lover girl" themed wine charms add a unique characteristic to every glass and can make identifying a wine glass at a party or event so much easier! All you need to do is attach it to the stem of a glass with the easy-to-hook loop, then pull apart the loop to hook or unlock. The 12 funny designs are a stiletto heel, star, diamond, lips, a dress, a rose, a dollar sign, a crown, a tote bag, a heart, a bow, and lipstick. All in all, these wine markers make for a unique, fun, light and fantastic gift for family, friends, partners or loved ones and will serve as a pleasant and nostalgic reminder of special friendships for years to come. Dimensions: Each charm is 1 inches in diameter and 0.19 inches thick. VARIED DESIGNS: The 12 funny designs are: a stiletto heel, star, diamond, lips, a dress, a rose, a dollar sign, a crown, a tote bag, a heart, a bow and lipstick. IDEAL GIFT: Makes for an excellent gift exchange idea or birthday gift for your party animal friend or family member!